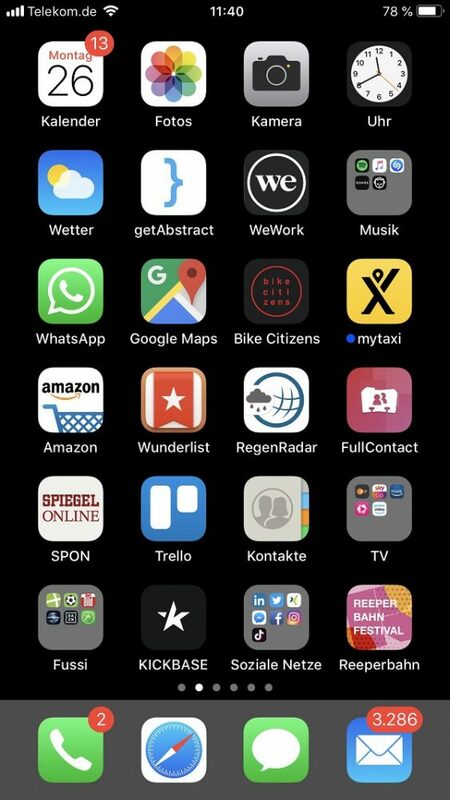 In the series “Homescreen!” We regularly present you the home screens of people from the social media, marketing, media and tech world – including exciting app recommendations and tips for everything from to-do lists to small games for in-between. Today: Willms Buhse, keynote speaker and managing director of Double Yuu management consulting. My smartphone has long been the most important control module of my digital life. Alone, therefore, the most important apps are all in the first tab. Since I do not make a difference between work and private life. What is important to me, comes right on the start screen. So among other things, my mails, WhatsApp (for Android) and Co. including Trello (for Android) necessarily on the homescreen. With many transformation customers we work with this tool. And since I travel a lot, this powerful collaboration tool must always be just a tap away. Also important to me is the We-Work app (for Android). I love the spirit of coworking space. For a Swiss medium-sized company, we have even set up a Digital Accelerator at We Work Hamburg. The home screen of Willms Buhse, keynote speaker and executive director of management consulting Double Yuu. In keeping with my close affinity to new work models, I prefer to cycle to my appointments, if possible. An indispensable help: Bike Citizens (for Android). If I have to change to the four-wheeler, Google Maps (for Android) and Mytaxi (for Android) are natural indispensable tech helpers. In short breaks, I dive into Get Abstract (for Android). The app is almost a modern classic and summarizes textbooks and studies in short abstracts. Here I like to get inspiration for my keynotes and our consulting mandates. But also one, two private applications belong on my homescreen. As a football fan I have a whole set of football apps installed. My favorite Kickbase (for Android) can be reached with one click. I have not been able to watch football for years without looking at the app at the same time. Last but not least, as a true North German, I think a lot on the rain radar (for Android) – whether I go to my son’s football game or do a gassi lap with our Labrador Lucky. Finally, a tip from the Hanseatic city: The Reeperbahn Festival (for Android) is an almost perfect mix of music happening with great live acts and technology conference. Tik Tok: The opportunity for companies to reach a young audience?